Unplug the power supply! On notebooks remove all accumulators! Prevent your PC components before static electricity! 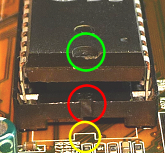 Proof and adjust the Pin position of your chip before insertion! 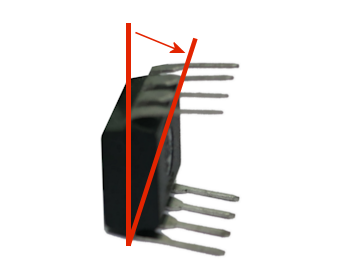 If all Pins are too far apart, place the chip sideways on a solid underground. Hold the body of the chip with both hands and press the body carefully against the 4 lower pins. 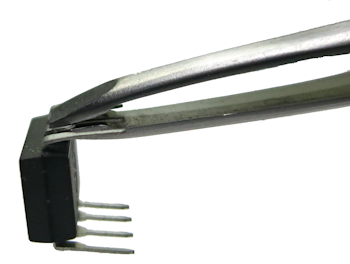 Bent pins can be re-aligned with a tweezer which has 2 flat ends. To do this, hold the pin which is bent and press the tweezer. Removal: Use a professional tool like the DIL-Extractor. If you don't have one, you can try it with one or two short and small screwdrivers. Pull the screwdrivers into the gaps between socket and chip, and pull him carefully out. Be careful while removing the chip! Use both ends of the chip to pull him out. You'll need some strength, but it might works. Installation: A DIL-Chip has on one of his small sides an impressed marker (see picture), and the DIL-Socket in most cases too. If the socket has no marker, take a look on the printed circuit board, to find the number "1" around the socket area. 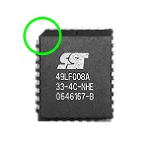 Put the chip's marker and the socket's marker on top of each other, or the chip's marker and the number "1". After installation: boot the PC, enter the Bios-Setup and load the "Default/Optimized Settings". If your PC don't start, please read the BIOS-FAQs! Notice: you can buy the DIL-Extractor in my Online-Shop. Removing a PLCC-chip without a professional tool like a PLCC-Extractor could be very difficult. Removal with PLCC-Extractor: insert one hook (middle picture, red marker) into the socket slit (left picture, red marker). Now do the same with the other hook. 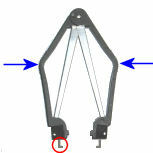 Press the Extractor against the socket and press at the same time the 2 Extractor legs (middle picture, blue arrows) together. Attention: don't pull the Extractor, press only the 2 legs together until the chip comes out! Removal without PLCC-Extractor: you can try one of these very little screwdrivers, or a curved piece of wire. 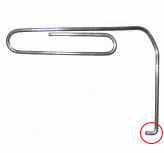 Another way is to use a paper clip. Take one or two paper clips and curve it to 90 degrees with a length of circa 2 millimeters. 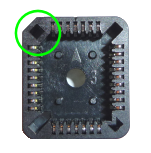 Installation: A PLCC-Chip has one flat corner as a marker (see picture), and the socket in most cases too. If the socket has no marker, take a look on the printed circuit board, to find the number "1" around the socket area. 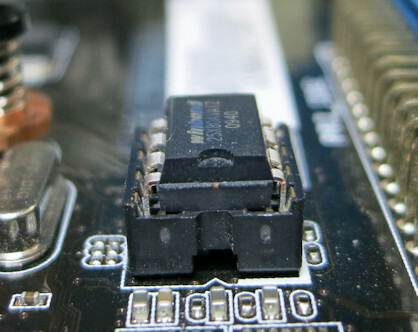 Put the chip's marker and the socket's marker on top of each other, or the chip's marker and the number "1". Notice: you can buy/order these PLCC-Extractor in my Online-Shop. I cannot find the BIOS Chip on the mother-board of my ASUS X71SL laptop. I saw only a sticker on motherboard :"666 AMIBIOS® NB© C1999 CC20 9610" - But NO CHIP under the sticker. SOP-8/SOIC-8 packages are normally soldered and must be desolder, only some manufacturers are using SOIC sockets for an easy replacement. 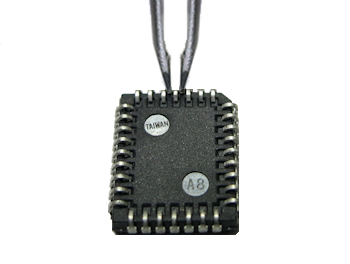 What about SOP-8/SOIC-8 package types? Those can´t be installed and removed?